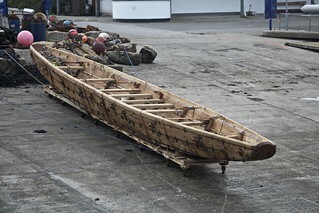 Morgawr, a reconstruction of the Bronze Age boat Ferriby 1. This image and the one below are from John Durrant's nice FlickR album that includes many good photos of construction details. Inside the Ferriby reconstruction. Cleats were left standing proud on the inside surfaces on the hull's main timbers when the logs were hewn to shape. The cleats provide anchors for transverse staves. The staves keep the longitudinal bottom timber and the iles (the angled "plank" pieces that form the turn of the bilge) from shifting longitudinally relative to each other, and provide some transverse stiffness to the bottom, but they do not act as frames: i.e., they do nothing to keep the "planks" tight against each other. 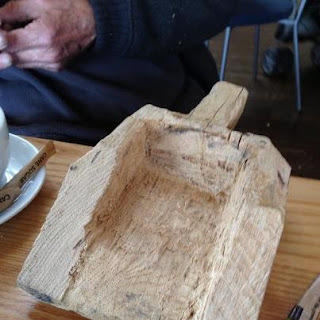 For that, the builders relied on stitching with yew withies. The seams were caulked with moss and animal fat, and covered with laths on the inside. 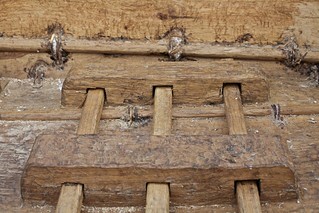 The laths are held down by the yew stitches, which pass through holes bored through the planks. Here's a short news item with a bit more background from This Is Cornwall, which we'll follow with this piece from BBC, featuring some nice footage of the boat in action, coupled with typically inane reporting. As a bonus: here's a bailer that museum expert Edwin Deady carved from oak and donated to the reconstruction effort. While the boat crew evidently didn't use it on the maiden voyage, one would hope that they'll soon adopt this more period-accurate accessory during future sea trials.